Asbestos in Your Roof – What are the Risks? Asbestos is widely regarded as a silent killer which can go often unnoticed, and the idea of its presence in the building surrounding you is enough to create feelings of uneasiness and concern. If you are the building owner then there is an additional responsibility involved as you could be held culpable for the effects of the substance. The dangers of the mineral have been well documented over the years and it has now been 15 years since the substance was completely banned from use in UK construction. So what does this mean for building owners today and what are the current laws surrounding it? Has the risk now subsided, and if not, what are the dangers to the current generation? Over the next few blog posts Sage BEC (formerly Sage Roofing) will be assessing the dangers surrounding asbestos in buildings, the risks it can pose and what you should do about getting it removed from your building. This is a good place to start if you want to know what you might be dealing with. The term “asbestos” is used for naturally occurring mineral products that are resistant to chemical & thermal degradation, are resistant to fire and electricity, have strong fibres, can be woven and can be used as a binding agent. There are two groups of asbestos. Serpentine, which is Chrysotile (white) asbestos; and amphiboles, which contains Amosite/Grunerite (brown) and Crocidolite (Blue) asbestos. There are three other types of Amphiboles – anthophyllite, actinolite, and tremolite which have no real commercial use, so consequently are rarely mined. The amphiboles are considered to be more dangerous than serpentines due to the shape and formation of the fibres, and there is more evidence linking them with asbestos related mortalities. With that said, all types of asbestos should be treated with caution and it is imperative to ensure that the correct protocol is followed when removing products containing the substance, especially in scenarios where you are unsure of the quantities present. Asbestos has been used for thousands of years in clothing, pottery, candle wicks and even in cadaver preservation. However, it has only been used regularly in the construction industry since the Industrial revolution when it was used for the likes of steam engines, boilers, turbines and pipe insulation due to its excellent fire resistance and insulation capabilities1. The product really began to flourish in the 20th century, particularly after the Second World War with the advance of technologies combined with a depletion of resources, high demand for reconstruction and an industry seeking cheap and effective building solutions. Worldwide production of Asbestos peaked in 1977 with 4,973,451 metric tonnes2 being manufactured over the year whilst being used in over three thousand different product types globally3. At the time of its prosperity, the mineral was seen as an “honour to humanity”4 and called by some as the “magic mineral”5; but as the deadly effects of asbestos became more apparent through medical research, demand for its use steadily declined. Reputable research such as ‘Asbestos as a Modern Urban Hazard’ written in 1963 and continued research by field experts Selikoff, Chung & Hammond6 from the same era outlined more conclusive evidence of the link between asbestos and the diseases becoming associated with it. The use of amphiboles was eventually banned in the UK in 1985 but it wasn’t until 1999 when serpentine (Chrysotile) asbestos was banned outright from construction in the UK7. This means that any building constructed before the turn of the century could still have asbestos containing products within them. Perhaps the most alarming aspect about the dangers of asbestos is that it typically takes 20-50 years until symptoms of asbestos related disease begin to develop (but it can potentially be anything from 10-60 years)8. HSE research has indicated that they expect asbestos related disease mortality rates to peak in 20169 due to the extensive latency period, so this not only calls for extra scrutiny of the health conditioning of those who may have been exposed to asbestos products in the past; but we must also ensure that any instances of suspected asbestos removal or deterioration are treated with the correct protocol to reduce the risk of future exposure. For further information on any of these conditions or diseases, please contact the NHS or visit their website. If you have any concerns that you may have been exposed to asbestos at any point then contact your GP for further advice. A Combined Killer – There is undisputed evidence that people who are exposed to asbestos and are smokers have a dramatically increased chance of contracting lung cancer, with the smoking acting as a catalyst for the development of the cancer. This has been linked to the effects already mentioned as the fibres give the hazardous chemicals found in cigarettes direct access to the bloodstream, which increases the carcinogenic effects dramatically. Due to its fantastic thermal qualities and being extremely fire retardant, it is not surprising that asbestos was extensively used in roofing and insulation in the 20th century. Cement sheets are one of the most commonly used roofing products that the mineral is found in, and there are still a large number of buildings around the UK that have an asbestos cement sheet roof. The problems with the roof sheets occur as they deteriorate with age and consequently become more brittle. This creates a greater risk of the mineral fibres becoming exposed and loose which puts people at greater risk. The removal of Asbestos cement sheets is generally Non-notifiable work, which means that this work can be done without the guidance of the local authority or HSE. This is because the asbestos mineral fibres being used are usually Chrysotile (white) asbestos, which statistically poses a lower risk than amphiboles asbestos. They also only account for approximately 10% of the composition of the sheet, meaning that the sheets are not considered to be such a priority risk to human health. It is also worth noting that if the asbestos cement sheets have not been weathered then this is considered a greater risk due to the additional damaging effects caused by weathering erosion of the sheets. As they are exposed to the elements they face the risk of degradation from frost, moisture, UV rays, and acid rain etc. leaving larger areas of the asbestos fibres unprotected. As a building owner, if you have any concerns over asbestos then it would be a good idea to get the roof looked at and surveyed by a specialist. The HSE website – has plenty of information on what to do if you are unsure as well as contact information on asbestos surveyors who can inspect your building. Once the survey has been completed then the next step may be to have the substance removed. Sage BEC (formerly Sage Roofing) can remove and dispose of roof and wall products which contain non-licensed asbestos as part of our refurbishment services for non-domestic properties. We can also act as the principle contractor for the job whilst using our own Health and Safety consultants to advise as your CDM co-ordinator throughout the duration of the works. Depending upon the condition of the asbestos product, there are usually a couple of options that we are able to offer to the client. Contact us today and talk to our team. If the sheets are in particularly bad condition whereby the asbestos fibres are exposed then it is likely that the best course of action would be to safely remove and dispose of the existing asbestos cement sheets and replace them with a safe and modern roofing solution. 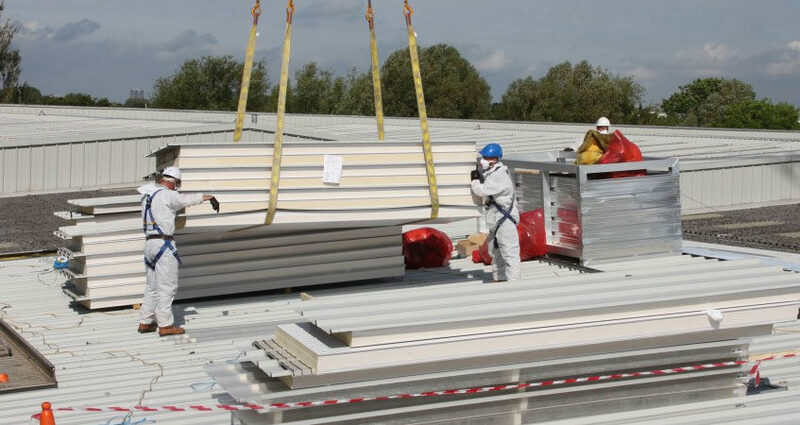 There are many aspects which need to be taken into consideration in these circumstances, and Sage BEC (formally Sage Roofing) are be able to offer complete transparency regarding the process of the works from the beginning, design a programme to suit your businesses requirements ensuring minimal disruption and most importantly, guaranteeing the health and safety of anyone in the building as our number one priority. We also make sure that all of our workers have undertaken the necessary training; they use the correct equipment and are suitably protected with the right PPE to ensure their own safety. In some cases whereby there is no damage to the cement sheets, then a completely acceptable option would be to simply ‘over clad’ the existing roof. With this option the asbestos cement would be completely contained and therefore would pose no threat to anyone internally and externally as well as offering a much more cost effective solution. We would be able to perform our own roof survey following the initial professional asbestos survey to determine which option would suit your business not only initially but also as a long term solution. By selecting Sage BEC (formerly Sage Roofing) to carry out these works, our clients can also take confidence in the additional security of £2 million professional indemnity, £5 million Public & product liability and £10 million employer’s liability insurances. For further information regarding the carrying out of non-licenced asbestos removal and refurbishment, please complete our contact form and our team will get back to you. Look out for our next post in which we will be assessing what you should be looking out for and whose responsibility it is to ensure the asbestos in your building is adequately controlled.